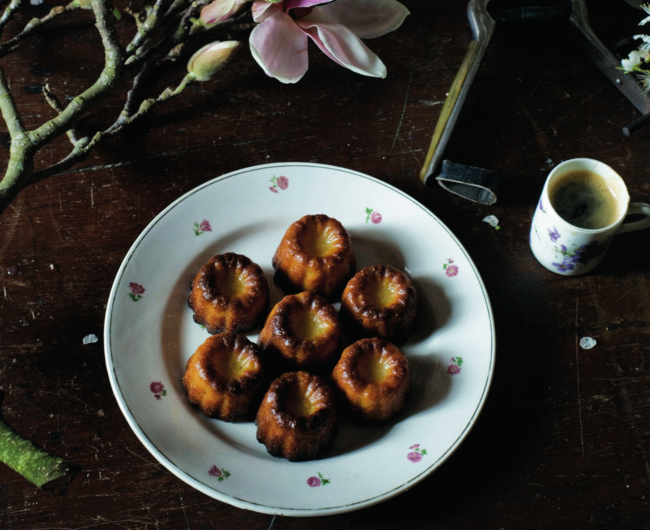 When I lived in Paris, canelés were a little treat that I bought regularly at my local pâtisserie. I always enjoyed them with coffee, and I knew they came from Bordeaux but otherwise had not given them much thought. Then we moved to Médoc, and they were everywhere. These days I love to have them with wine after dinner. Although the traditional copper moulds are much more beautiful and special, I usually use a silicone one for practical reasons; it is so much easier to clean. Canelés should have a caramelized crust and a soft inside, so you and your oven might have to make several attempts before they turn out absolutely perfect. In a medium saucepan, whisk together the milk and vanilla seeds. Bring to a boil, then remove from the heat and set aside for five minutes. Whisk in the sugar and flour, trying to avoid lumps (if there are many lumps, simply strain the batter through a sieve). Add the egg yolks one by one, whisking gently to mix. Stir in the butter. Finally, add the rum and whisk the batter until smooth. The batter should be similar to a crêpe batter – not too thick, not too thin. Cover and refrigerate for 24 hours. Fill 16 canelé moulds two-thirds full. Bake for exactly five minutes, then lower the oven temperature to 180°C and bake for an additional 50 minutes, or until the canelés are dark brown. Let the canelés cool in the moulds for five minutes, then unmould them on a wire rack. The canelés will keep for several days in a sealed container at room temperature. NOTE: Because I use silicone moulds, I don’t grease the moulds. If you use metal moulds, brush them well with melted butter.